First, let me apologize for the "funky" way this post has formatted itself. I've been having all kinds of problems with Blogger this week! 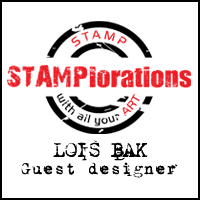 Our Stampin'B hostess this week, Vicky Gould, asked us to make our own background paper -- no DP, just stamps. 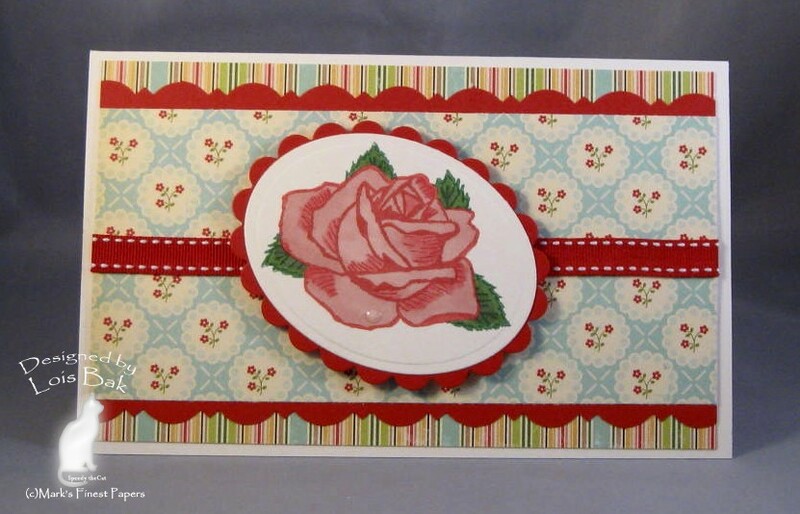 While not technically "background" paper, I did make the patterned paper at the top of my card, using the smallest rose and leaf from Mark's Finest Papers set, Roses for You. After stamping the roses with Memento Tuxedo Black, I masked them one at a time and stamped the leaf image around the roses; then I colored them with Copic markers. One of my favorite places to find layouts is Page Maps ,where I found this layout. After cutting out my patterned paper with the largest Labels Nine die, I matted it with some MFP August Greens, cut with scissors to match the shape. I have found that, if you trace the die on cardstock and cut it out with scissors, you can get a very nice mat (not too wide). Then I punched the opening for the ribbon and ran it around all the layers, tying a nice bow. 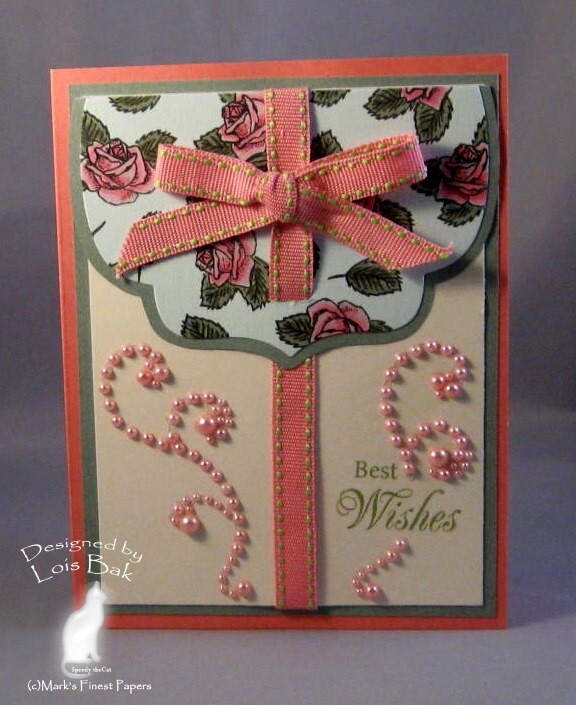 I stamped the sentiment with Memento Bamboo Leaves and added the pearl flourishes. Thanks, Vicky, for the challenge. It was time-consuming but quite satisfying. -------- Stamps - Mark's Finest Papers Roses for You Paper - MFP Speedy the Cat's Cream, Strawberry Freeze, August Greens, China Blue Eyes Ink - Memento Tuxedo Black, Bamboo Leaves Accessories - Copic markers, Ribbon, Labels Nine, Pearl Flourishes --------- Thanks for stopping by my blog today. It's been a week since I've posted to my Blog -- life does get in the way of fun, you know. Anyway, as I've said before, the Saturday Inspiration Challenge on SCS is my favorite one of the week. You can go in any direction you'd like with your creations. 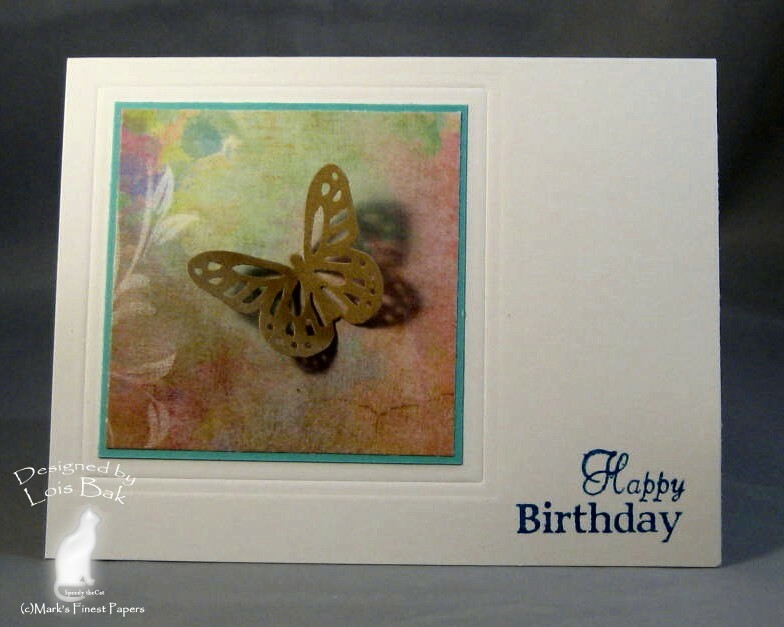 My first card, a Clean and Simple design, was inspired by this "floating with butterflies ring." 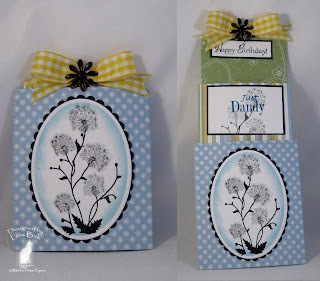 I used some brand-new DP for my background -- Prima Fairy Floral -- and matted it with MFP Aqua Light. 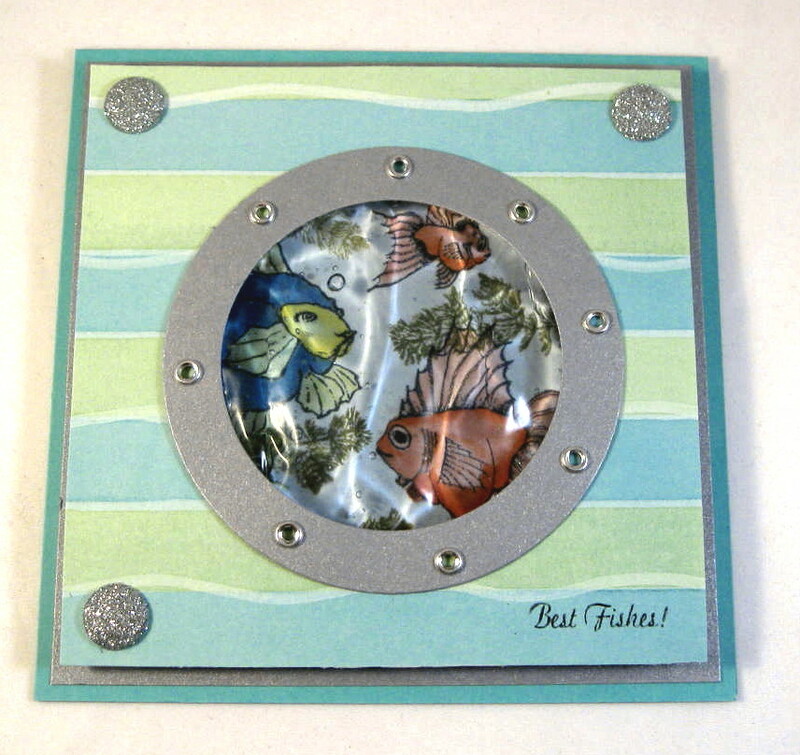 Using a square nestie, I created the embossed frame around the aqua/DP square. The butterfly was punched with a Martha Stewart punch and attached at the center with some Scor-tape, allowing the wings to float. 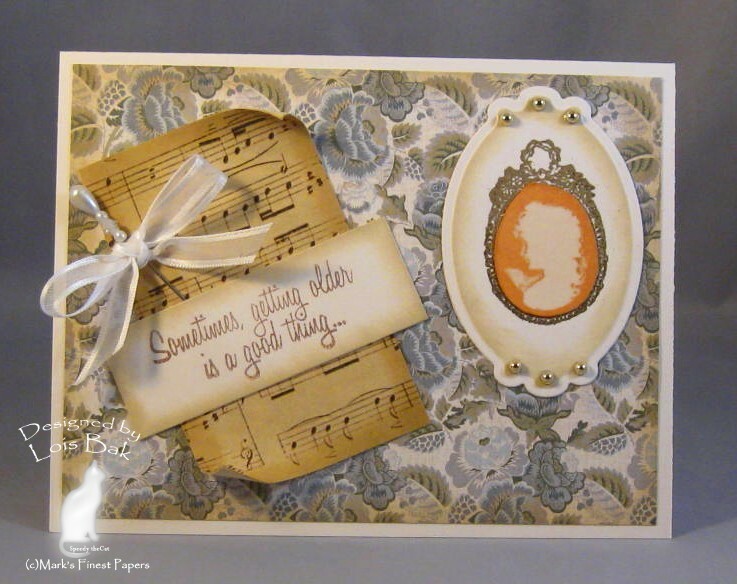 The sentiment, from Mark's Finest Papers' Daffodil and Anise set, is stamped with Versafine Deep Lagoon and clear embossed. Because of all the wonderful inspiration on the Ruche site, I had to make a second card -- using this buttons print as the starting point. All the DPs on my card are from Cosmo Cricket's Material Girl paper pad, matted in MFP Dark Chocolate Bar cardstock. The SCS sketch challenge this week was quite interesting. I was able to use three different patterns from the Material Girl pad -- making the buttons the most prominent. 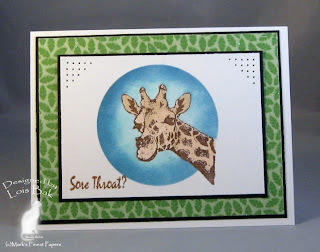 Speedy's Friends' challenge this week was to use both heat and dry embossing and also to have at least one element popped up. I stamped the mannequin in Versafine Sepia and clear embossed it. Then I stamped it again using Versafine Toffee, clear embossed it, and colored the skirt using Memento markers. After cutting out the skirt, I attached the waist using Scor-tape and popped up the bottom. The sentiment is also popped up. All images are from Mark's Finest Papers' Sew What? set. 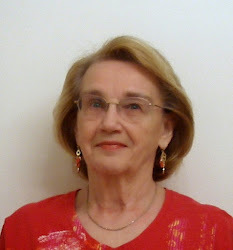 Today is Saturday and time for my favorite SCS challenge -- the Inspiration Challenge. Today's site is Kirkland's, a home decor store. We used to have a Kirkland's in the mall; but, like so many chains, they have left the mall and are strickly on-line. My first card was inspired by these lovely pillows, which come in several colors, but I liked the brown and blue the best. I stamped the vine from Mark's Finest Papers Brick Wall set several times with Versafine Sepia onto a panel of MFP Breezy Blue, turning my block each time so that the pattern was varied. Then I clear embossed it. 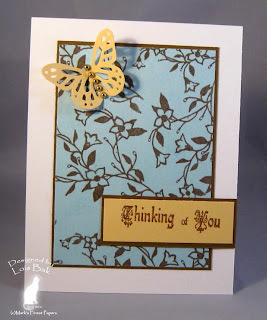 I used this week's sketch as my layout, so there wasn't much more that I needed to add -- the Martha Stewart buterfly and a sentiment from the same set. My second card was a little more involved. Inspired by this charger, I cut three strips of MFP cardstock (Spring Green Parchment, Hazelnut Tan, and Desert Sand) and glued them down on a piece of paper. 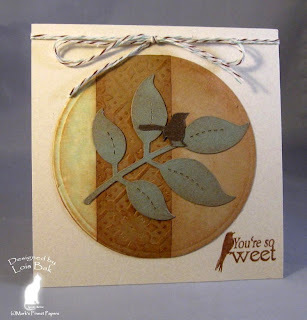 Then I cut the circle with the largest Classic Circle nestie and distressed it with Tim Holtz Tea Die ink. I cut the leaves using a Sizzix die and stamped the bird from MFP Tweet Blessings. I then mounted the circle onto a 4 3/4 inch square card of MFP Corn Husk, added the sentiment and baker's twine -- and I was through. 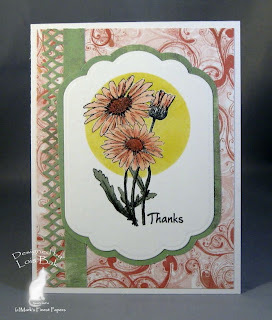 As hostess for this week's Stampin'B challenge, Emily wanted us to make a thank you card using spring colors -- one of which had to be pink. I colored my Mark's Finest Papers' gerber daisies using Copic markers in several shades of pink. One of my favorite techniques is Reverse Masking. I like the way it can highlight your image. I cut out the daisies using a Labels Eleven nestie and mounted it on some Basic Grey Two Scoops DP. The strip down the side was made with a Martha Stewart border punch. It's not quite a CAS card, but it is flat and shouldn't take any extra postage. 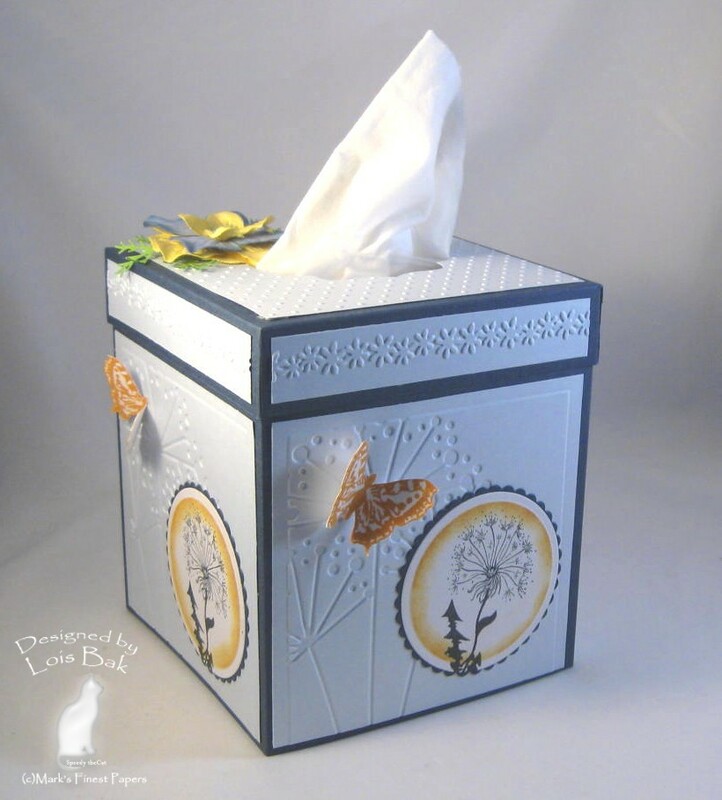 Welcome to the MFP March Blog Hop! This month, we are releasing 4 NEW SETS! Our New Sets are: Just Dandy, African Veldt, Grandma's Boudoir, and Fish You Were Here. For your convenience, all 4 stamp sets are available for purchase TODAY! We have a NEW Blog Candy Contest! 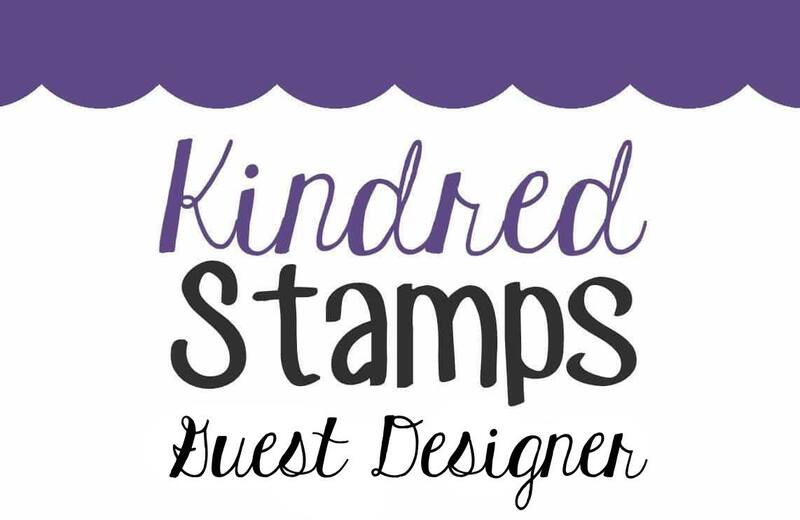 BE A GUEST DESIGNER! 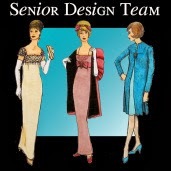 All Blog Hop participants will have the chance to win a Month Long GUEST DESIGNER position on our Senior Design team! That’s right! ONE lucky winner will receive a Guest Designer package that will include April 2011’s Four New Release sets, a selection of Premium Papers, and beautiful embellishments. 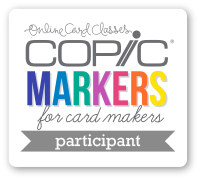 The winner will also receive a Guest Designer Watermark, Blog Button and have the choice to participate in the April 2011 Blog Hop! What do you need to do to qualify? 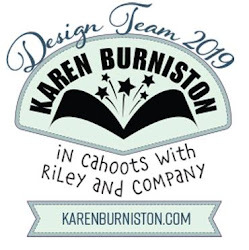 Just comment on the Design Team blogs during the blog hop. 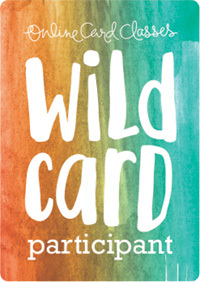 EACH DAY that participants comment on all the Design Team blogs, their name will be entered once in the random drawing. Each participant has the opportunity to have his/her name entered up to four times. (There are four days of the blog hop, so there are up to four entries per person.) The winner will be announced on the Mark’s Finest Papers blog on Saturday, March 12, 2011. Although I'm not officially a part of the blog hop today, thanks for stopping by and taking a look at what I did with today's set, Fish You Were Here. 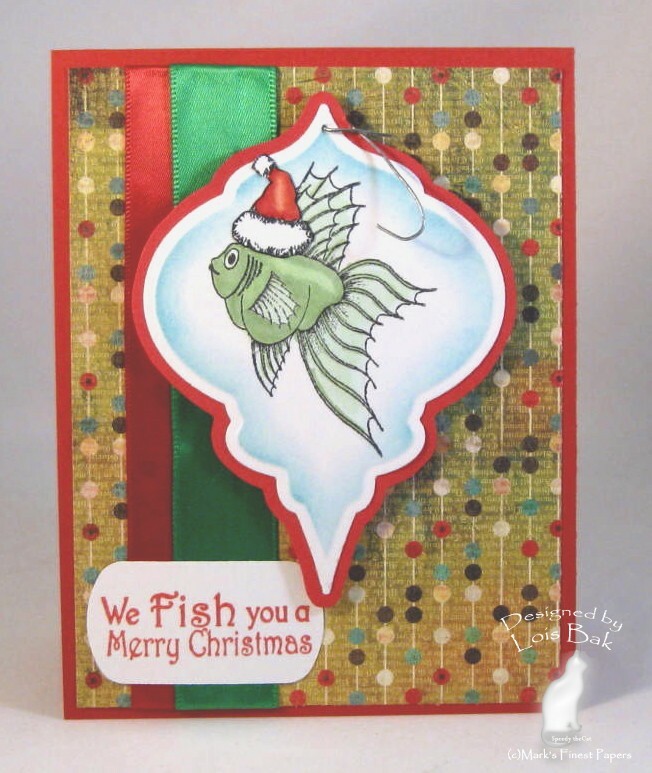 When I first saw today's set, I swore that I would never use the "fish you a merry Christmas" sentiment. It seemed way too "punny" for me. BUT, I decided to be a good sport and use it. After I stamped the fish and colored him with Copic markers, I cut him out using one of the Spellbinders Heirloom Ornaments dies, sponging in the shading before removing the die. Do you think that ornament hook looks like a fish hook? 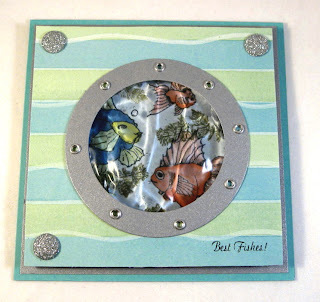 About five or six years ago, I made a gel (water) card using the tutorial on Splitcoaststampers. I thought this might be the time to make another one. I made the porthole by cutting the silver cardstock with two circle nesties and adding some eyelets. 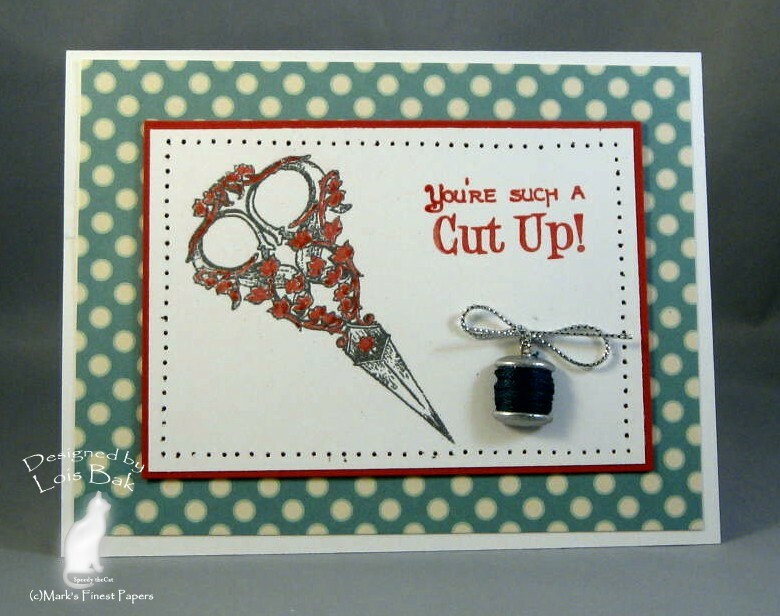 I wouldn't try mailing this card -- for one thing, it's very heavy; and for another, I'd be afraid that the zip lock bag would break or leak! 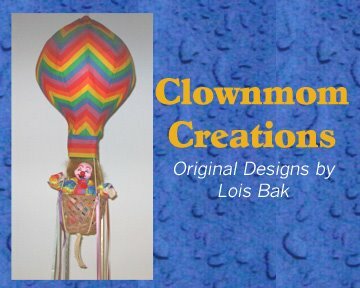 Please visit the rest of the design team members' blogs and see their creations. My first card using today's set, Grandma's Boudoir, is for both the MFP Blog Hop and the Stampin'B Challenge to use bling on your card. As you can see, my bling is the pearl and rose flourish. I'm glad I didn't live in the era of wearing corsets. That looks sooo uncomfortable. But, as the sentiment implies, the corset made you look marvelous! My second card is a little plainer. I stamped the cameo twice -- once in silver pigment ink and then embossed with Detail Silver embossing powder; and again with VersaMagic Aegean Blue chalk. After cutting out that portion of the blue cameo that would be the stone, I pressed Versafine on it and embossed with clear embossing powder -- twice, to give it a nice shine. Then I glued it down onto the silver image. The layouts for both of my cards were found on Page Maps. Make sure you visit the rest of the team members' blogs to see what they did with this lovely set. For my first card using today's set, African Veldt, I used the reverse masking technique to spotlight this giraffe. After making the circle in a scrap piece of paper, I sponged on Tim Holtz Distressed inks in two colors - Tumbled Glass and Faded Jeans. 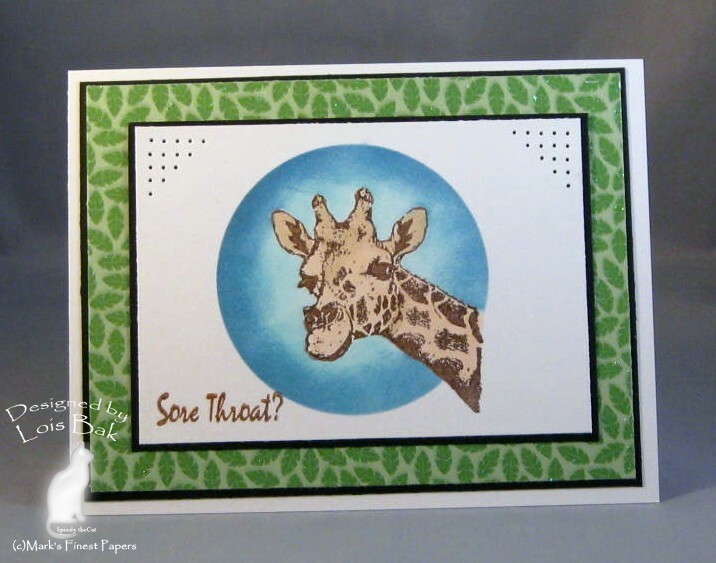 I made this Criss Cross card using MFP Deep Olive and patterned papers from DCWV's Safari Chic paper pad. The elephant head is colored with Copic markers. I used the SCS Triple Tier Slider Card tutorial for my first card using today's set, Just Dandy. If you look closely, you can see where I added Polar White Flower Soft to the dandelions on the front. 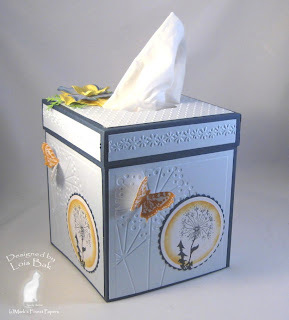 My second project is not a card -- but a tissue box cover. I know a lot of people who have allergies, and dandelions tend to bring out the worst in them. So I figured a box of tissues might come in handy. Be sure to comment on all the blogs to qualify for the prize. Next stop on the hop is Vicky . It's no secret that the Inspiration Challenge is my favorite of the week. This week's site was a British store Cath Kidston. I founds lots and lots of inspiration there -- thus, my three cards for the challenge. 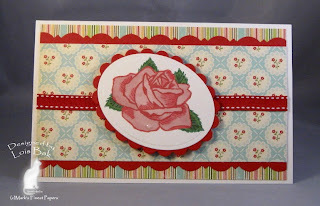 My first card was inspired by this fabric, with its blue background and reddish pink roses. I found some DP in a new paper pad by K & Company called Julianne. The only problem was the roses on the DP were cream-colored. So I grabbed a couple of Copic markers and changed the colors. 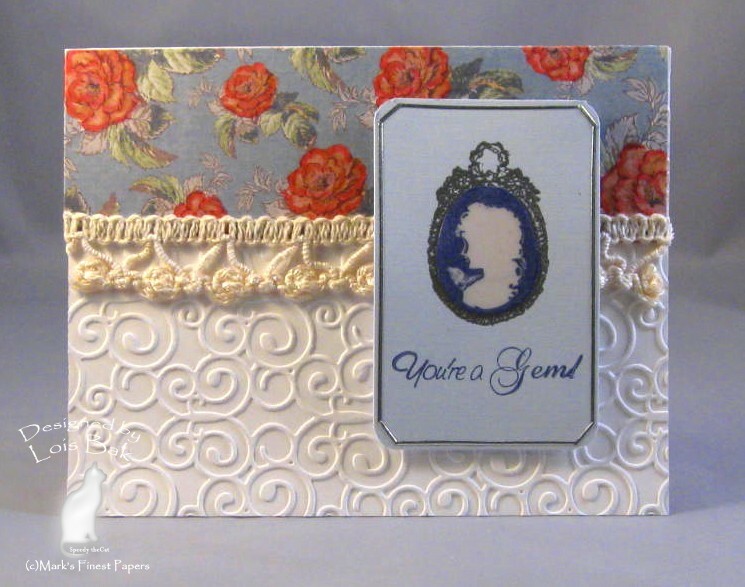 The cameo is from a soon-to-be-released set from Mark's Finest Papers, called Grandma's Boudoir. 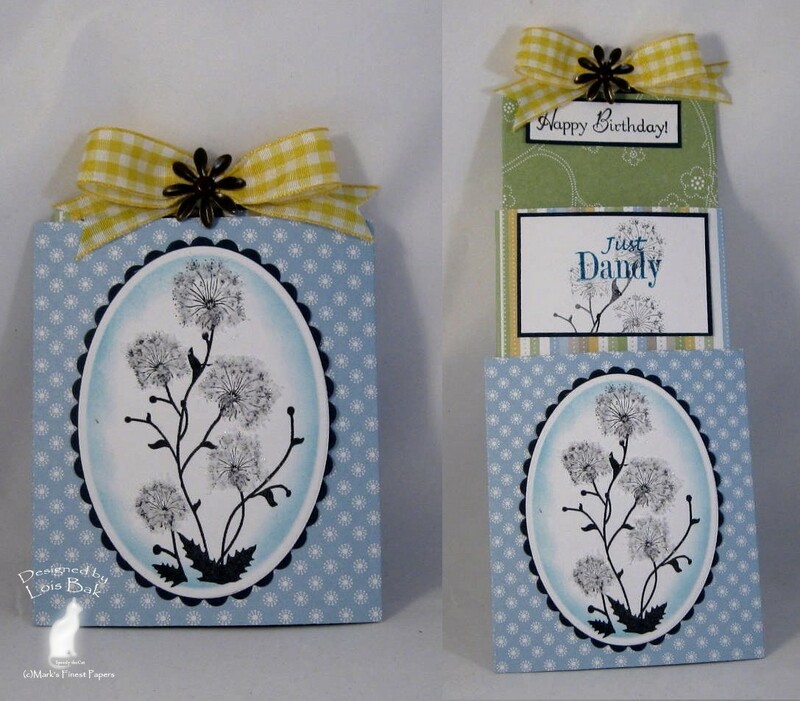 I stamped the image twice, once in silver on the pale blue cardstock, and a second time on cream. 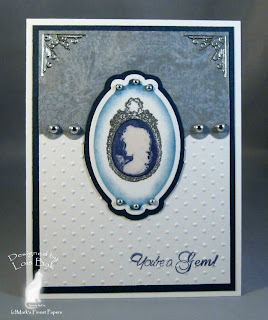 After cutting out the blue "stone," I embossed it twice with clear embossing powder and then glued it down on the silver. I outlined the blue panel with some silver stick-on lines and mounted it on my card with pop dots. My second card was inspired by this kilt pin, with its sewing theme. It's pretty self-explanatory. Images are from MFP's Sew What? set and DP is another one from October Afternoon's The Thrift Shop pad. The thread spool charm was originally brass, but I pressed it into the silver pigment ink and embossed it with detail silver embossing powder. Then I wrapped some blue embroidery floss around it to match the charm on the pin. I hadn't planned to make three cards today; but, as I was looking through my October Afternoon Thrift Shop DP pad, I found the some paper that immediately reminded me of this fabric swatch -- and another card was inevitable. This is one of my favorite Mark's Finest Papers' sets, Roses for You. I colored it with Copic markers and cut it out with oval Nestabilities. I added a little drop of Crystal Effects for the dew drop. All of the layouts for my cards today came from Page Maps. Thanks for stopping by and looking at my Inspiration Challenge cards. 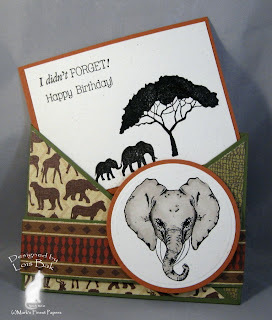 Joanne asked us to use music on our Stampin'B cards this week. 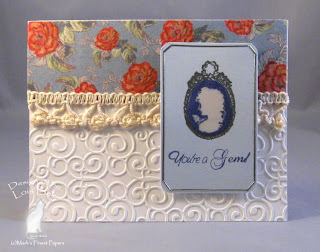 I used the opportunity to showcase a new stamp set from Mark's Finest Papers -- Grandma's Boudoir. The cameo was stamped twice: once in gold and again in pumpkin. I cut the center of the pumpkin image out, around what would be the stone. 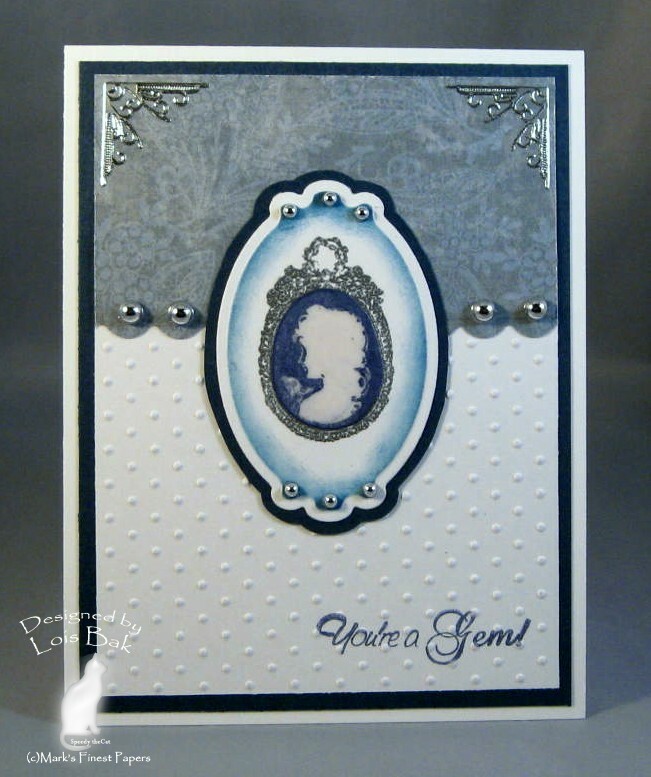 I then stamped it with Versamark and clear embossed it -- to give it a shiny look, similar to what a cameo would look like. I then glued it to the gold image and cut it out using a Labels Ten die. I like the look of sheet music on a card. I cut a small piece and sponged around the edges to give it a vintage look, sponging the back corners so that the rolled portion would look distressed too. I mounted the sentiment in the center after gluing down the corsage pin/ribbon.